We've already talked about the importance of a strength training plan for runners on this post. We even gave you a routine to try yourself! Since then, while we were scrolling through our Instagram feed, we came across another fitness ministry - the Soul Strength Sisters! From Emily and Jenny: "It was fun creating this plan specifically for runners. Women can complete this plan quickly by just going through it one time or making it a longer workout by repeating the whole thing three times." We've given you a detailed description of each move. At the bottom of this page, you'll also find a video of Emily and Jenny performing the workout. These moves are more advanced than our last one. Feel free to make adjustments! Get in plank position with your hands shoulder-width apart. Lower your chest toward the floor while keeping your upper arms parallel to your sides and your elbows pointing straight back. Then lift up your hips so that your body forms an upside down V. Your legs and arms should stay as straight as possible. Starting in the push-up position, move your outside hand and foot to the side followed by the inside hand and foot so that you move 4"-8" to the side. Stand with feet wider than shoulder-width apart and your toes slightly turned out. Now squat! Return to the starting position. Hold a dumbbell in each hand with your arms fully extended at your sides and your palms facing each other. With your feet hip-width apart, place the instep of your rear foot on a bench. Your feet should be approximately three feet apart. Lower your hips toward the floor so that your rear knee comes close to the floor. Pause and drive through your front heel to return to the starting position. Sit in a chair. Stand up, but only three-fourths of the way! Repeat. Grasp barbell from rack or deadlift from floor with shoulder width to wide overhand grip. Stand with shoulder width or narrower stance. Lower bar toward top of feet by bending hips while tracing front contour of legs through downward motion. Gradually bend knees through descent and keep spine straight so back is near horizontal at lowest position. Once hamstring is stretched fully just before lowering bar to completely to floor, lift bar by extending hips and knees until standing upright. Pull shoulders back slightly if rounded. Repeat. Hold a pair of dumbbells and stand with your feet hip-width apart, knees unlocked. Bending at the hips and keeping your back flat, lower the weights toward your shins. Stand by contracting your glutes and hamstrings. Using your momentum, bend your elbows and curl the weights to your shoulders. Lower the weights and return to the starting position. Start in a plank position with your legs wider than hip-width distance; the wider stance makes you more stable. Hold onto your dumbbells, keeping your wrist locked to protect the joint. With your core tight and your glutes engaged, exhale, stabilizing your torso as you lift your right elbow to row; feel your right scapula sliding toward your spine as you bend your elbow up toward the ceiling. Keeping your neck long and energized, return the weight to the ground and repeat the movement on your left side. Still confused? Watch the video on their YouTube channel! 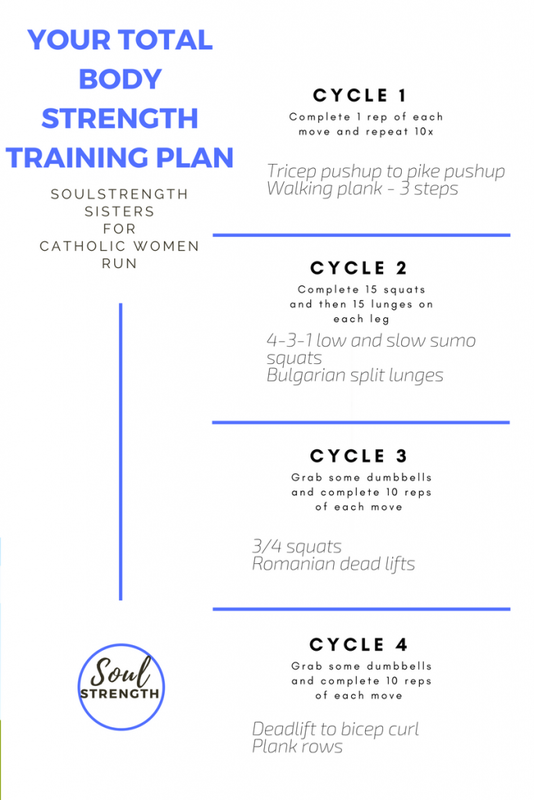 When you find time for to try out this strength training plan for runners, snap a photo and tag #CatholicWomenRun on Facebook and Instagram!